Hello ECR! 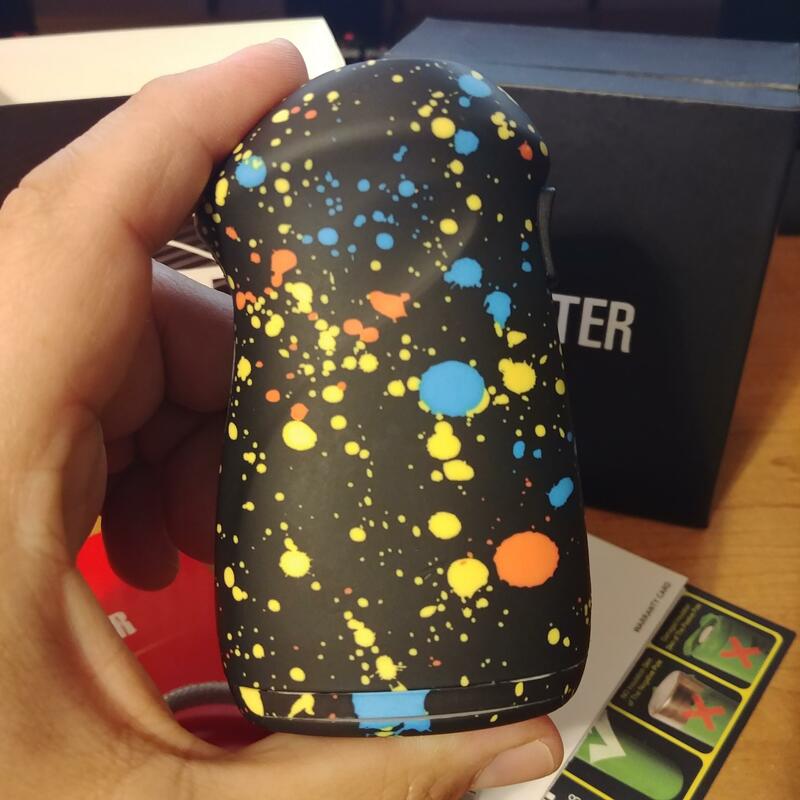 Today I am reviewing for you the Hugo Vapor Orbiter! 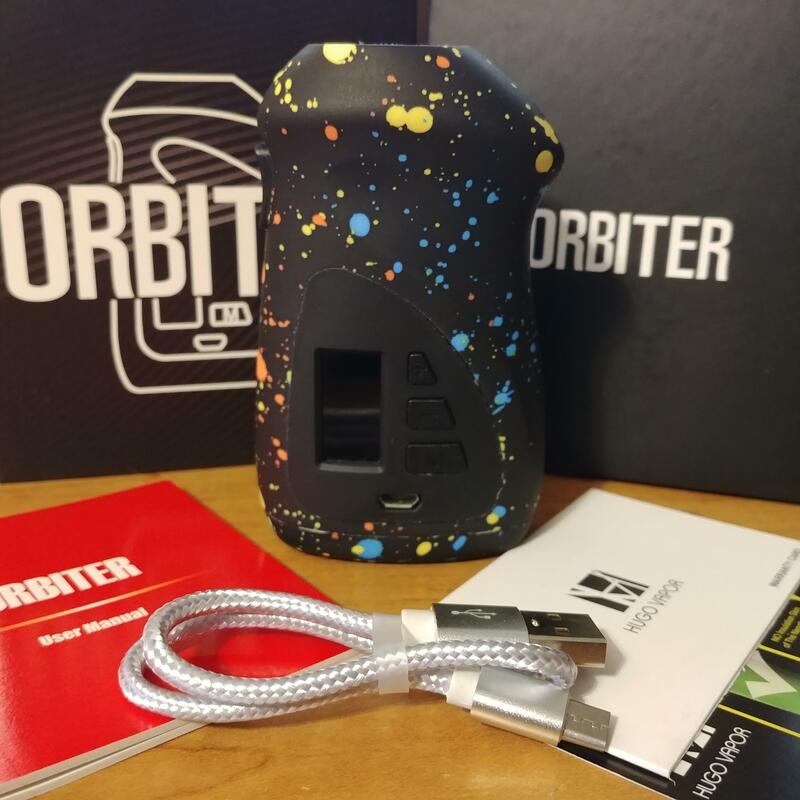 The Orbiter is extremely lightweight and has a very ergonomic design to it. Does it perform as well as it feels? Read below for my evaluation. 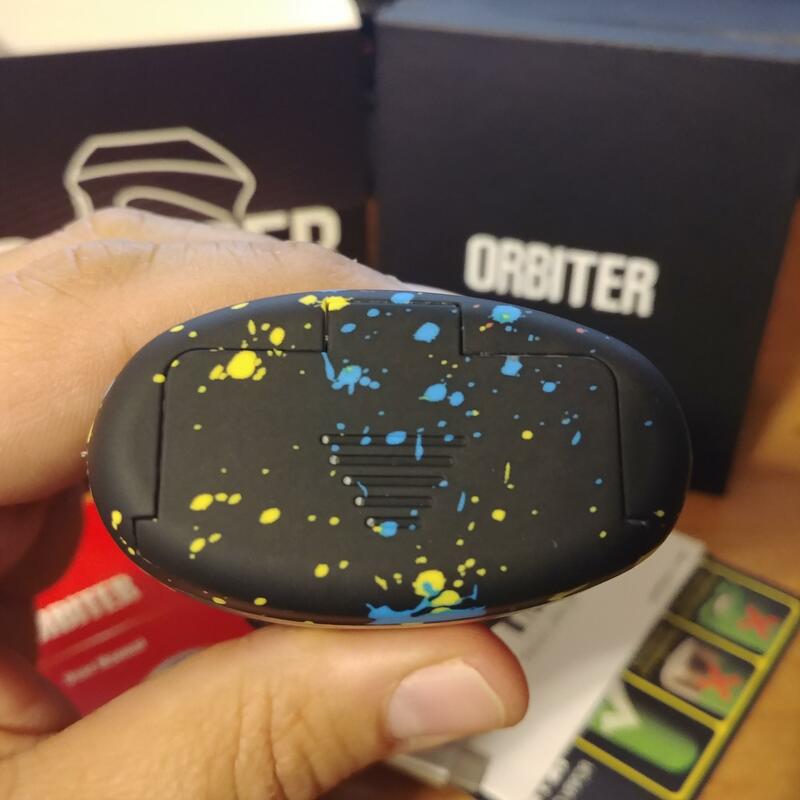 I have had the Orbiter for 3 weeks now and feel I can give a fair assessment of its quality. 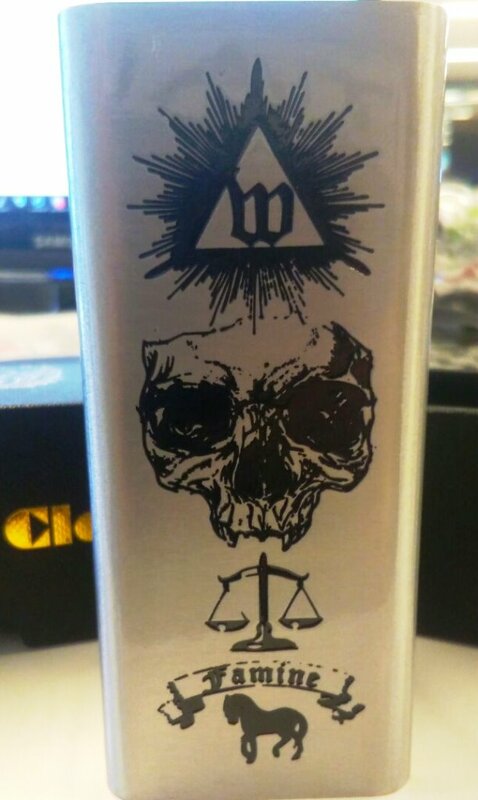 This product was sent to me from Hugo Vapor for the purpose of a review. 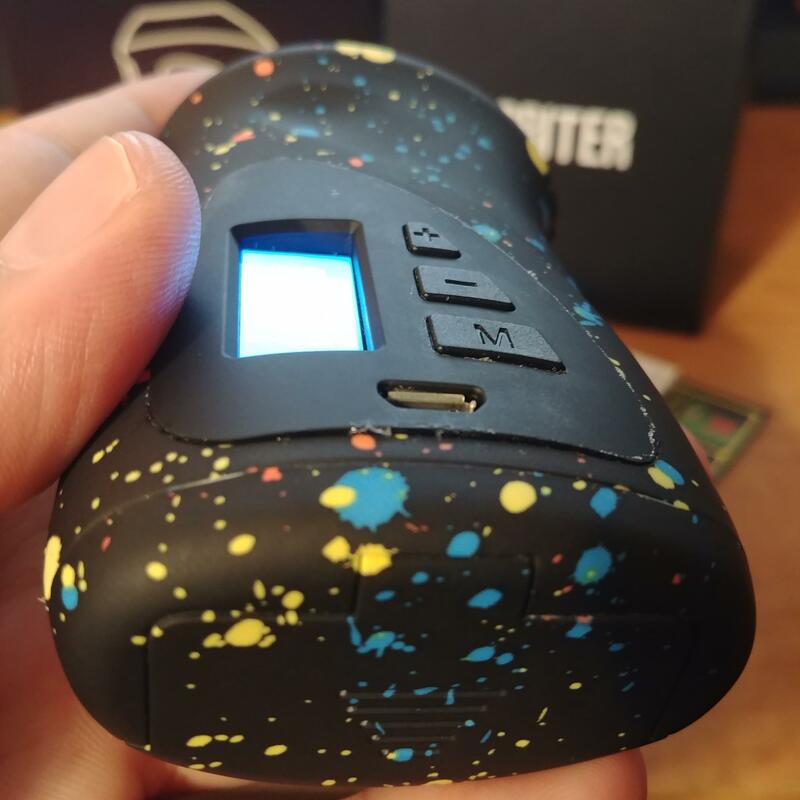 Current color options include Splatter, Flash, and Red Camo. 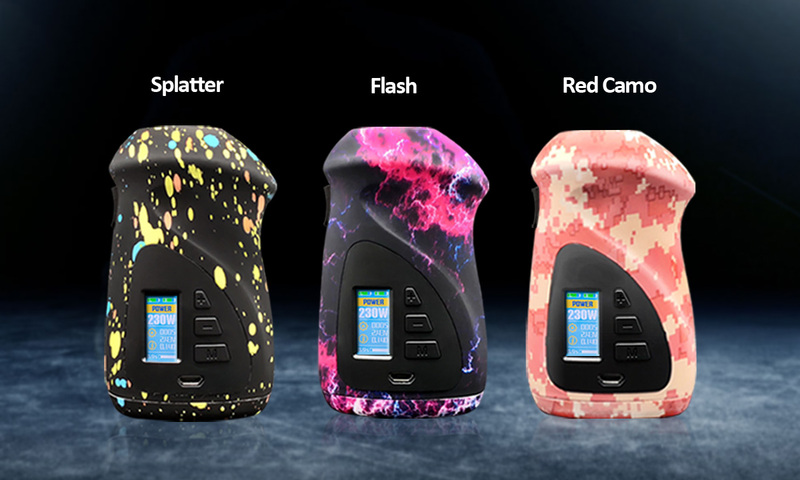 Hugo Vapor is probably best known for their their Boxer and Squeezer devices. I've never owned either of those, and didn't realize it but they also have quite a few other devices to their catalog that have seem to flown under my radar. The Orbiter is one such device, and I'm quite surprised I hadn't heard much about it regardless of the few incidents I had with it. But I'm getting ahead of myself. Let's jump off this review and start at the best place possible: the top. Top/510: The Orbiter houses a decently large 510 plate embeloshed with a…star of David? That might not have been what they were going for, but that's what it is. The plate is secured to the device via two torq-head screws and had plenty of space to house larger attys. 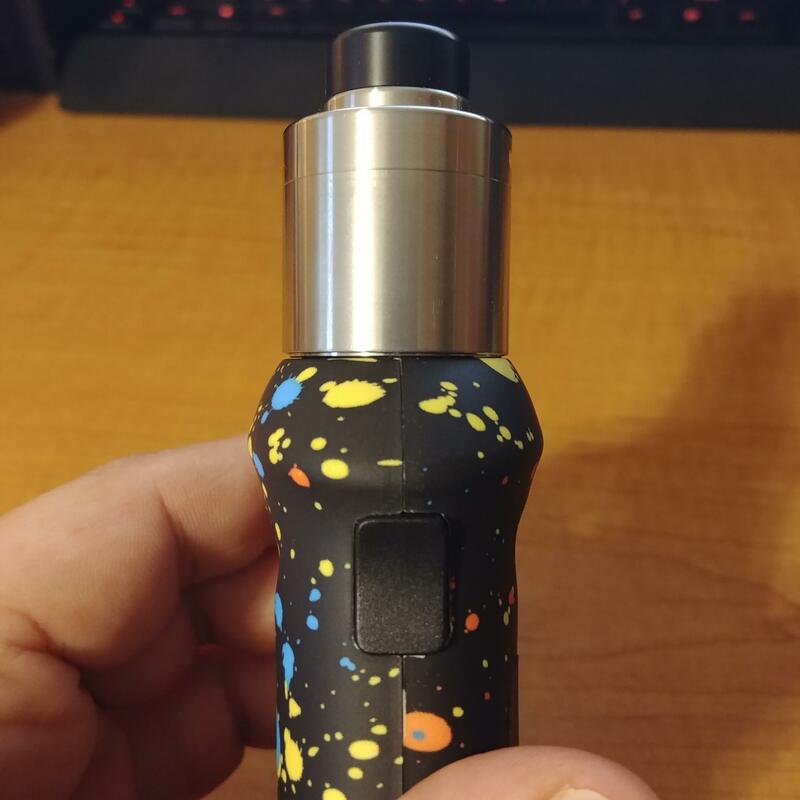 24mm attys look good on the device, but you can pretty much go up to 30mm without overhang! The threading of the 510 is a bit stiff and not quite as smooth as many other devices I have used. The positive pin is gold plated and spring loaded and travels quite a bit. If you have some attys with larger pins, you won't need to worry about whether or not they'll fit. Fire Button: The fire button of the Orbiter is a trigger-styled button located at the perfect position for index-finger firing. The button protrudes about 3-4mm from the device and is contoured for comfort. The throw of the fire button is fairly short, yet it requires a sufficient amount of pressure to activate so unintentional fires aren't an issue. It is quite clicky and activates well. Buttons/Screen/Menu: The device utilizes a +, -, and Menu button for navigating the features and menus. The screen is beside the buttons and they all rest within a faceplate on the device. The buttons are pretty stiff and clicky and the screen is quite small, yet sufficient. Here is where I realized the first few issues. The faceplate appears to be secured to the device with some kind of glue. I'm not sure whether the glue heats up from using the device, but it seeps out around the edges of the faceplate and leaves a sticky mess. I also noticed this glue slightly seeping out from around the buttons. This is quite annoying. I have been using the device for a few weeks and, while it has gotten better, I still notice it occassionally. Also, the faceplate seems to be separating from the device a bit towards the bottom (see Defect 2 image above). They really should have found a better way to secure this to the device as it's quite offputting. I really like the use of a menu button on the device for accessing menus and modes. It's quite intuitive and helps to keep unnecessary wear away from the fire button. The Orbiter has a few customization options through the menu such as brightness and theme color, but there's really not much to it. 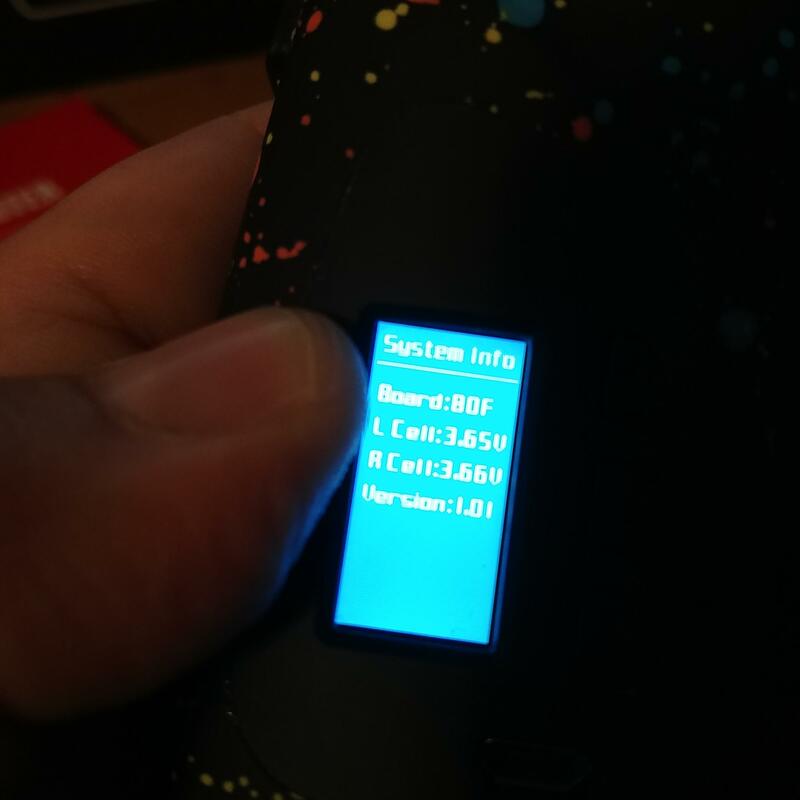 This device really isn't about the screen or the menu though, so it works for what it is. Battery Door/Tray: Batteries are secured in the device via a hinge-style battery door. I initially had some issues with the battery door. It was a bit hard to open/close at first, but has loosed up over the weeks of usage. It is quite secure once you get it on there though, and I don't have to worry about it accidentally popping open. However, the batteries seem a bit tight in the tray. This is evident by parts of the door being pushed on with batteries inside the device and protruding about 1-2mm from the device. While the hinge on the battery door is pretty nice, the batteries need a bit more room to prevent the issue. Size/Styling: The Orbiter doesn't seem to have been designed to have the greatest screen or to be the classiest looking device. It was designed to be a comfortable device on the go, in which it has succeeded. The shape is pretty atypical, and reminds me slightly of a pistol grip of sorts. The ergonomics of it is spot on! Whether you're left-handed or right-handed it has perfect grooves that make holding it quite natural and comfortable. Gripping the device intuitively leads you to rest your index finger on the fire button. I don't really know how else to say it, but this device was designed to be held comfortably and succeeds. As for the styling, I could take it or leave it. I'm not the biggest fan of the splatter design, and the other designs don't really catch my fancy much either. Some may like it…I am indiferent. One more thing I want to note here. The device has a few holes located on the side of the device that seem to be manufacturing defects (see Defect 1 image above). This could potentially be battery venting, yet there is a slit below the second hole on my device that seems to be a defect. Not sure if this is present on all devices, but it was on mine. Performance: With the few issues I noted with the device, I wasn't really expecting much performance wise. I have to say, I was pleasantly surprised at how well the Orbiter performed. Power mode hits very well. 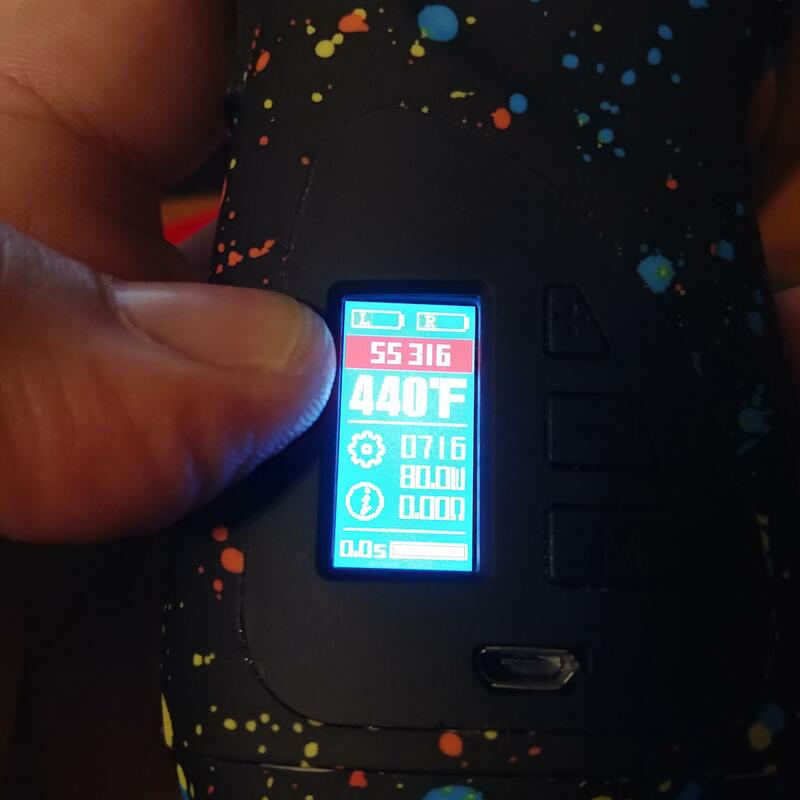 Ramp up is a bit on the slow side and isn't as instantaneous as say VooPoo or Smoant devices, but once it gets going it performs quite well. As for TC…again, I was very surprised at how it performed. The TCR for SS seemed a bit high stock for my personal preference, but it's very easy to change the value and adjust your wattage. TC did pretty well at throttling back power when necessary and has some fairly decent dry-hit detection. It's not the greatest TC, but it's definitely passable. TC was tested using a few different AVS SS builds, including 26×30 claptons and 30×4/40 quad-core fused claptons. DID I MENTION THE ERGONOMICS!? I'm quite torn about this device. I'm very annoyed with the seeping gunk, the issues with the faceplate, the manufacturing defect with the device casing, and the slightly protruding battery door. 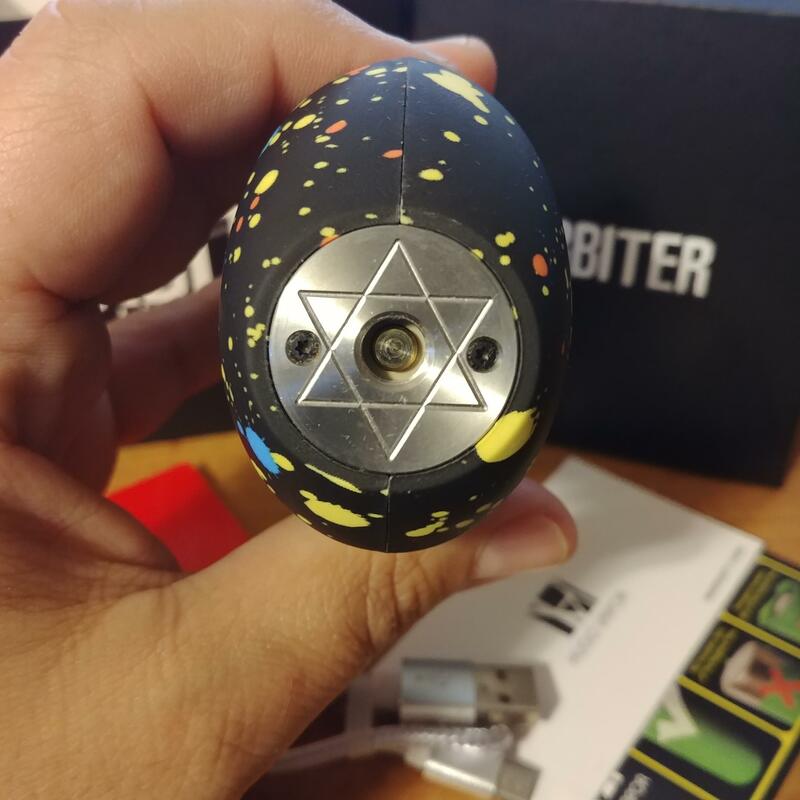 However, the Orbiter is extremely lightweight, feels amazing in the hand, and performs pretty well. I would say if you can find it at a great price, it will be a nice little beater device to carry around with you. If you're looking for something classy looking and is well built, you may need to look elsewhere. …for your attention ECR. I hope you all have a great rest of your week! I want to give another shoutout to Hugo Vapor for giving me the opportunity to provide this community with this review. If you want to check them out, you can follow them on [Instagram]. 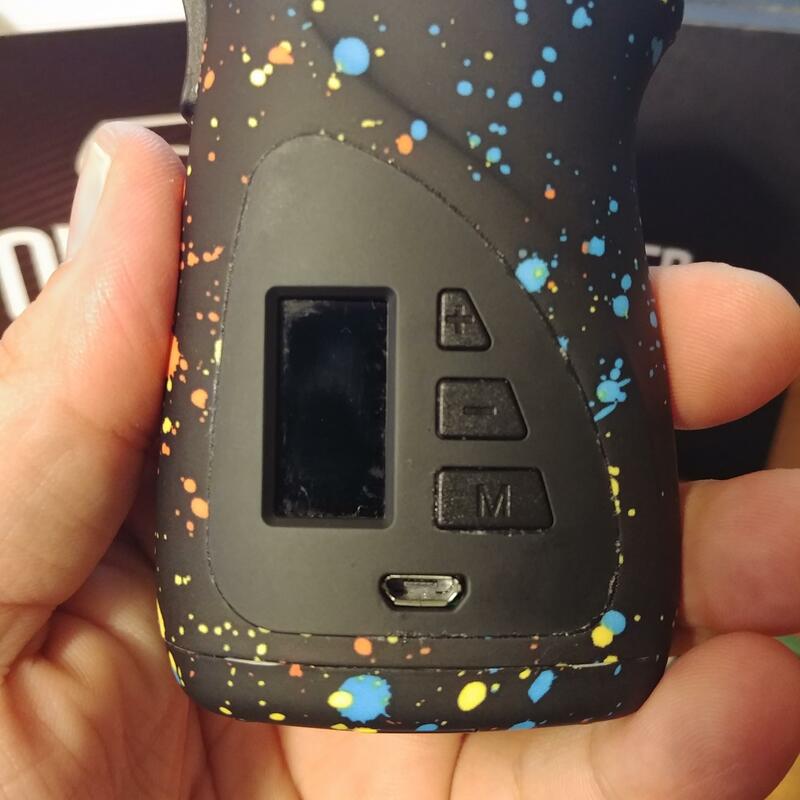 I say this is an Average Vaper Review because I am coming at this from the perspective of someone who has been vaping for a while (8 years), but doesn't get too in-depth with the technical aspects of the products. I'm evaluating these products as to how well they work out the box, their ease of use, and whether or not they hold up over the course of use. I don't have the skill set to produce thorough testings of the electronics and I defer that to those better suited. This review is purely my experience using the items I received. Hello ECR! Today I am reviewing for you the Hugo Vapor Orbiter! 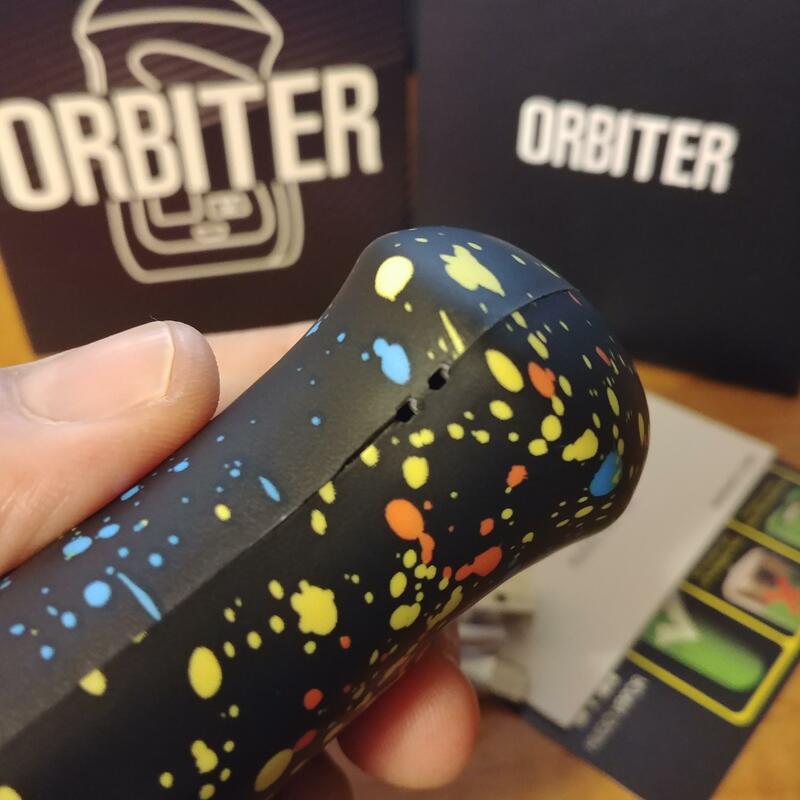 The Orbiter is extremely lightweight and has a very ergonomic design to it. Does it perform as well as it feels? 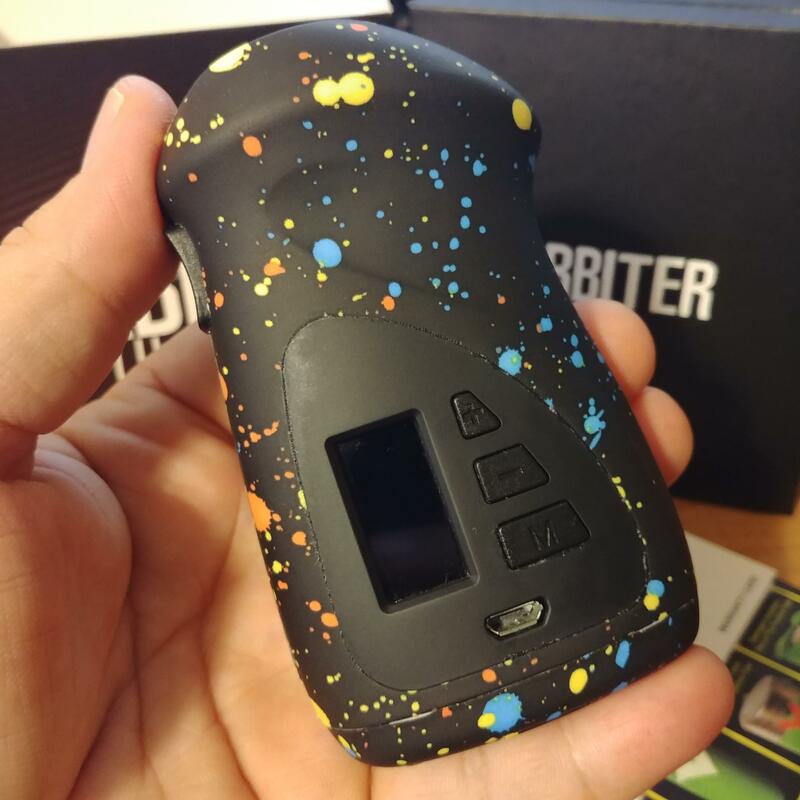 Read below for my evaluation.I have had the Orbiter for 3 weeks now and feel I can give a fair assessment of its quality.This product was sent to me from Hugo Vapor for the purpose of a review.SpecsDimensions: 96mm x 58mm x 38mmWeight: 70gBattery Type: Dual 18650Wattage Output Range: 1-230WResistance Range: 0.06-3.0ohmsModes: Wattage/TC(NI-Ti-SS)/TCR/BYPASS/Preheat/Custom User ModeMaterial: Nylonfiber and Stainless Steel0.96″ TFT Color DisplayErgonomic ShapeBottom-Loaded Hinged Battery DoorFirmware Upgradable (via USB)Current color options include Splatter, Flash, and Red Camo.ContentsOrbiter 230W Box ModMicro USB CableInstruction ManualPicsFor Convenience, a full album has been posted, as well as individual picturesAlbumContentsOrbiter510Fire ButtonScreen/ButtonsBackBattery DoorBattery TrayPower ModeTC ModeTC AdjustSettingsSystem Info24mm30mm 130mm 2Defect 1Defect 2 Operation5 click fire button on / 5 click offHold Menu button for Settings / System InfoSettings: Time/Puff/Brightness/Theme Color/Reset3 click Menu button to scroll through modesIn TC Mode: 3 click fire button – Adjust TCR setting/Set WattageFire & – to lock resistanceOrbiterHugo Vapor is probably best known for their their Boxer and Squeezer devices. I’ve never owned either of those, and didn’t realize it but they also have quite a few other devices to their catalog that have seem to flown under my radar. The Orbiter is one such device, and I’m quite surprised I hadn’t heard much about it regardless of the few incidents I had with it. But I’m getting ahead of myself. Let’s jump off this review and start at the best place possible: the top.Top/510: The Orbiter houses a decently large 510 plate embeloshed with a…star of David? That might not have been what they were going for, but that’s what it is. The plate is secured to the device via two torq-head screws and had plenty of space to house larger attys. 24mm attys look good on the device, but you can pretty much go up to 30mm without overhang! The threading of the 510 is a bit stiff and not quite as smooth as many other devices I have used. The positive pin is gold plated and spring loaded and travels quite a bit. If you have some attys with larger pins, you won’t need to worry about whether or not they’ll fit.Fire Button: The fire button of the Orbiter is a trigger-styled button located at the perfect position for index-finger firing. The button protrudes about 3-4mm from the device and is contoured for comfort. The throw of the fire button is fairly short, yet it requires a sufficient amount of pressure to activate so unintentional fires aren’t an issue. 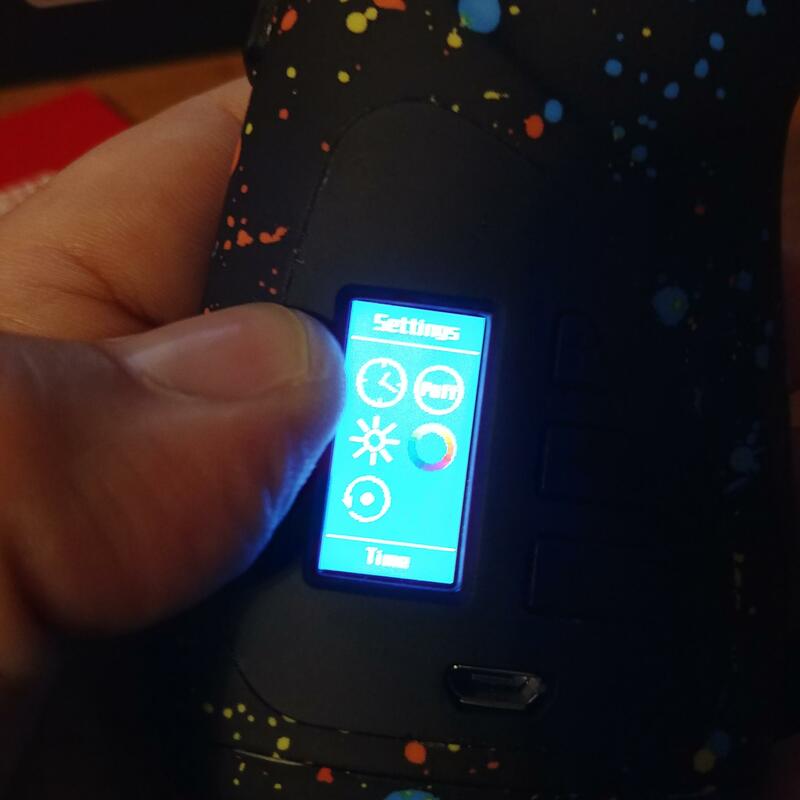 It is quite clicky and activates well.Buttons/Screen/Menu: The device utilizes a +, -, and Menu button for navigating the features and menus. The screen is beside the buttons and they all rest within a faceplate on the device. The buttons are pretty stiff and clicky and the screen is quite small, yet sufficient.Here is where I realized the first few issues. The faceplate appears to be secured to the device with some kind of glue. I’m not sure whether the glue heats up from using the device, but it seeps out around the edges of the faceplate and leaves a sticky mess. I also noticed this glue slightly seeping out from around the buttons. This is quite annoying. I have been using the device for a few weeks and, while it has gotten better, I still notice it occassionally. Also, the faceplate seems to be separating from the device a bit towards the bottom (see Defect 2 image above). They really should have found a better way to secure this to the device as it’s quite offputting.I really like the use of a menu button on the device for accessing menus and modes. It’s quite intuitive and helps to keep unnecessary wear away from the fire button. The Orbiter has a few customization options through the menu such as brightness and theme color, but there’s really not much to it. This device really isn’t about the screen or the menu though, so it works for what it is.Battery Door/Tray: Batteries are secured in the device via a hinge-style battery door. I initially had some issues with the battery door. It was a bit hard to open/close at first, but has loosed up over the weeks of usage. It is quite secure once you get it on there though, and I don’t have to worry about it accidentally popping open. However, the batteries seem a bit tight in the tray. This is evident by parts of the door being pushed on with batteries inside the device and protruding about 1-2mm from the device. 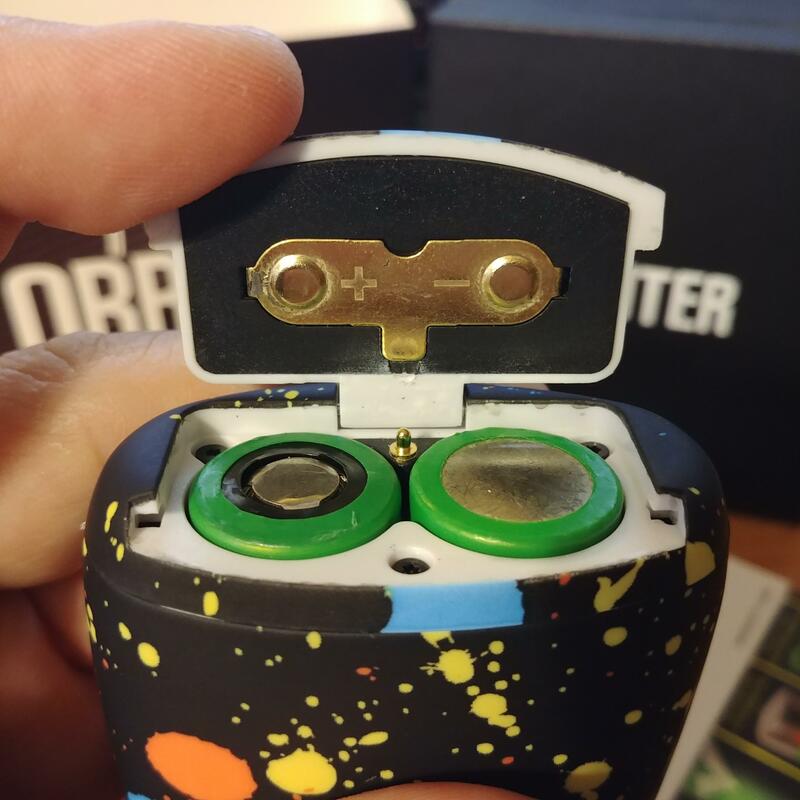 While the hinge on the battery door is pretty nice, the batteries need a bit more room to prevent the issue.Size/Styling: The Orbiter doesn’t seem to have been designed to have the greatest screen or to be the classiest looking device. It was designed to be a comfortable device on the go, in which it has succeeded. The shape is pretty atypical, and reminds me slightly of a pistol grip of sorts. The ergonomics of it is spot on! Whether you’re left-handed or right-handed it has perfect grooves that make holding it quite natural and comfortable. Gripping the device intuitively leads you to rest your index finger on the fire button. I don’t really know how else to say it, but this device was designed to be held comfortably and succeeds. As for the styling, I could take it or leave it. I’m not the biggest fan of the splatter design, and the other designs don’t really catch my fancy much either. Some may like it…I am indiferent.One more thing I want to note here. The device has a few holes located on the side of the device that seem to be manufacturing defects (see Defect 1 image above). This could potentially be battery venting, yet there is a slit below the second hole on my device that seems to be a defect. Not sure if this is present on all devices, but it was on mine.Performance: With the few issues I noted with the device, I wasn’t really expecting much performance wise. I have to say, I was pleasantly surprised at how well the Orbiter performed. Power mode hits very well. 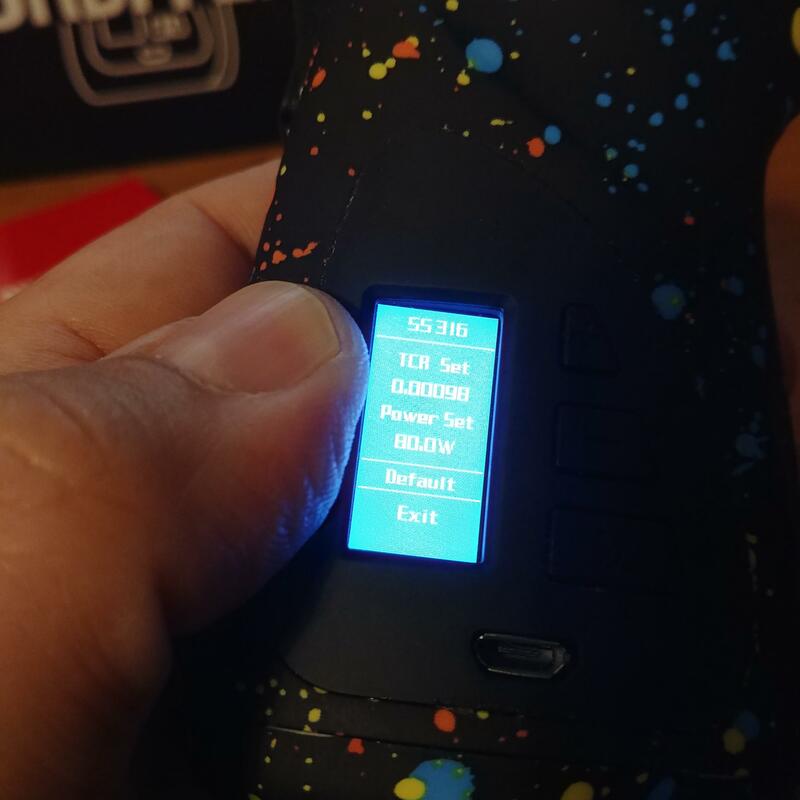 Ramp up is a bit on the slow side and isn’t as instantaneous as say VooPoo or Smoant devices, but once it gets going it performs quite well. As for TC…again, I was very surprised at how it performed. The TCR for SS seemed a bit high stock for my personal preference, but it’s very easy to change the value and adjust your wattage. TC did pretty well at throttling back power when necessary and has some fairly decent dry-hit detection. It’s not the greatest TC, but it’s definitely passable. TC was tested using a few different AVS SS builds, including 26×30 claptons and 30×4/40 quad-core fused claptons.Final ThoughtsProsLarge 510 plateSeats up to 30mm attysLong throw in the positive pinNice trigger-styled fire buttonClicky buttonsMenu button implementationBattery door very secureBattery hinge is well doneExtremely lightweightDID I MENTION THE ERGONOMICS! ?Power mode performanceTC performance quite decentConsStar of David?510 threading a bit stiffSeeping glueFaceplate appears to be separating from deviceBattery door initially hard to open/closeBatteries a bit tight and cause battery door to not sit flushHoles on the side of the device (could be battery venting, though)Ramp up a bit on the slow side I’m quite torn about this device. I’m very annoyed with the seeping gunk, the issues with the faceplate, the manufacturing defect with the device casing, and the slightly protruding battery door. 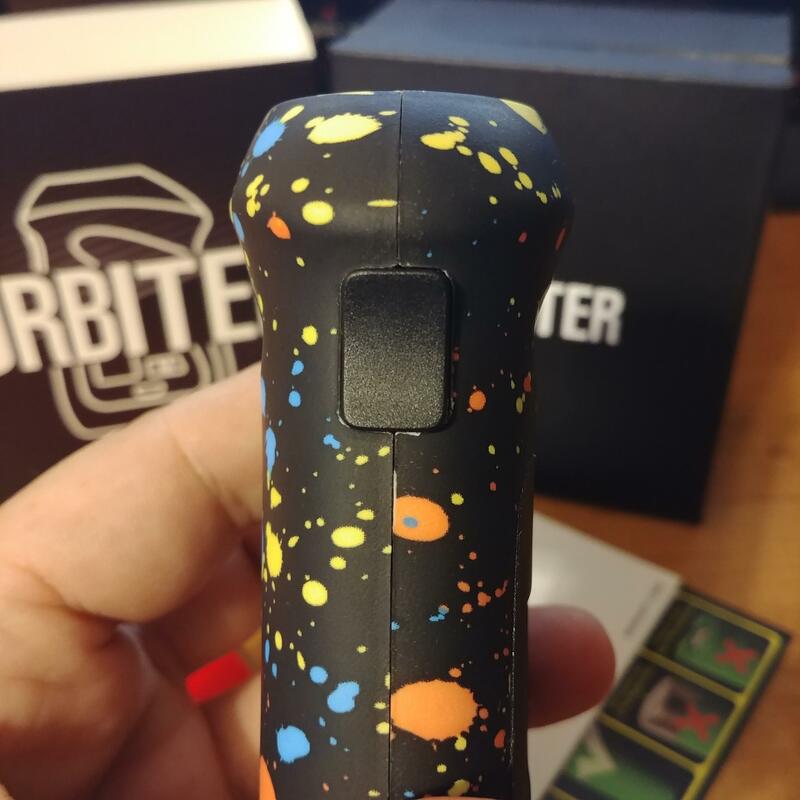 However, the Orbiter is extremely lightweight, feels amazing in the hand, and performs pretty well. I would say if you can find it at a great price, it will be a nice little beater device to carry around with you. If you’re looking for something classy looking and is well built, you may need to look elsewhere.PurchasingFasttech – $32.923fvape – $35.59Healthcabin – $39.99ElementVape – $49.95Thank you……for your attention ECR. 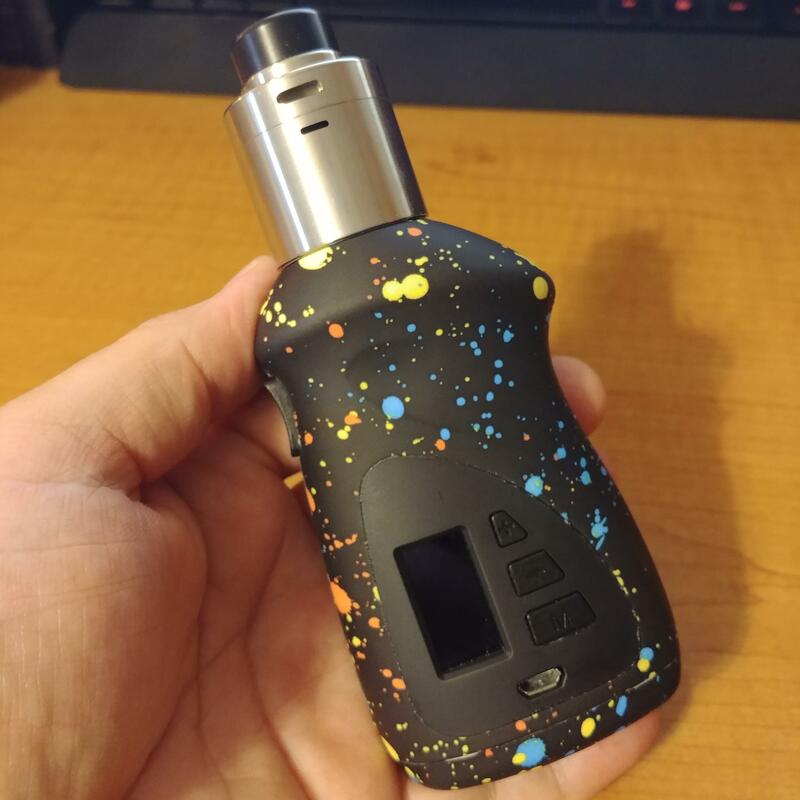 I hope you all have a great rest of your week!I want to give another shoutout to Hugo Vapor for giving me the opportunity to provide this community with this review. 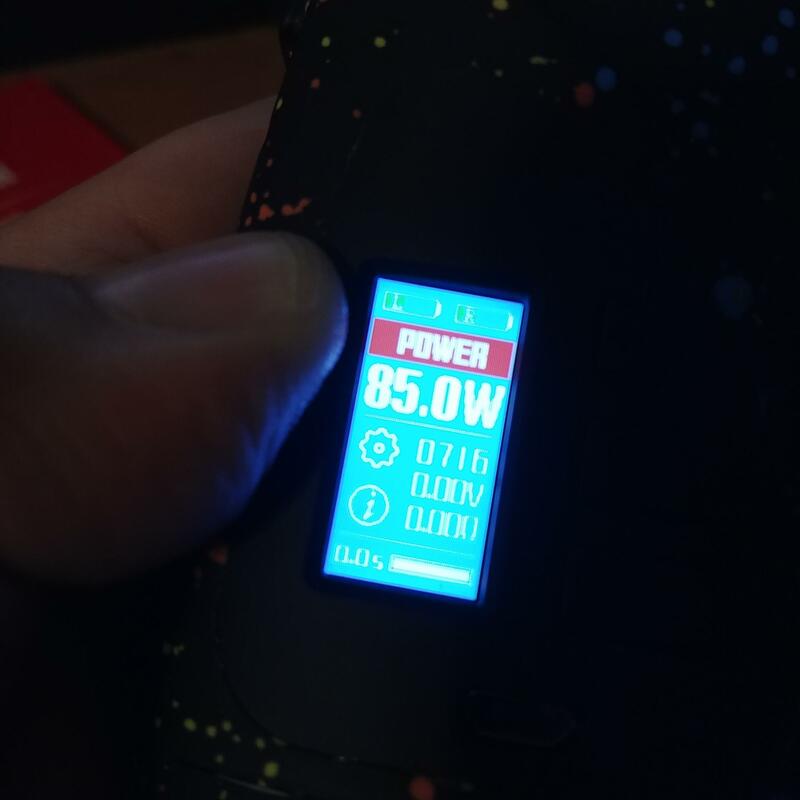 If you want to check them out, you can follow them on [Instagram].AboutI say this is an Average Vaper Review because I am coming at this from the perspective of someone who has been vaping for a while (8 years), but doesn’t get too in-depth with the technical aspects of the products. I’m evaluating these products as to how well they work out the box, their ease of use, and whether or not they hold up over the course of use. I don’t have the skill set to produce thorough testings of the electronics and I defer that to those better suited. This review is purely my experience using the items I received. 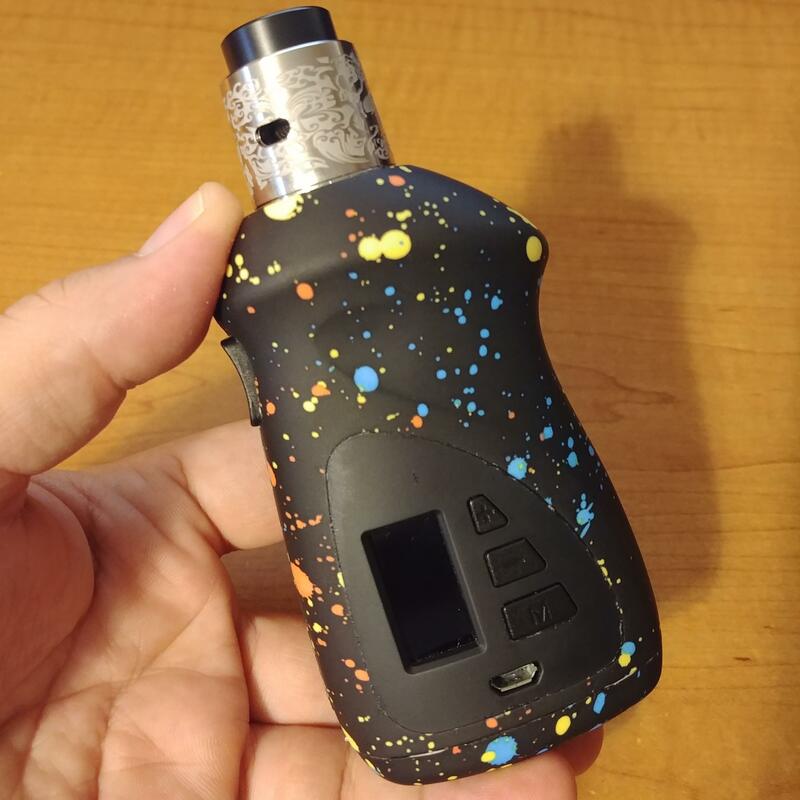 Link to a list of my Reviews Upcoming reviewsGeekVape Nova KitSnowwolf Mfeng Kit (sponsored by HealthCabin)Pico Squeeze 2 (sponsored by SourceMore)Hugo Vapor RangerVsticking VK530 KitThinkVape ThorSmok Species V2Smok E-PrivWellon LUXHava OneHava Firefly KitStageVape Venus RDAGeekVape Loop RDAWake Mod Co Little Foot RDAHellvape Drop Dead RDAOBS Bat 218W TC Kit Also, if you want to keep up with me, you can follow me on Instagram.